A classic American treat is increasing in popularity in markets around the world. The smell, appearance and taste of soft cookies, freshly baked at the point of sale from frozen dough, have proven irresistible to consumers for decades. They manage to be both a profitable line for manufacturers and retailers and an affordable impulse buy for consumers. Food service manufacturers in Europe have invested recently in frozen dough extrusion machines from Baker Perkins, the leading supplier of equipment in North America. The full Baker Perkins range, meeting output needs from craft to plant-scale bakeries, is now being introduced around the world. Food service manufacturers with a frozen food distribution system sell frozen cookies to every retail outlet in North America: high street shops and cafes, schools, hospitals, workplaces, stations and airports. Cookies in a wide choice of flavours and sizes, and with a variety of inclusions, are baked at the point of sale to produce an enticing aroma. Extra value can be added to the cookies with toppings. A prime characteristic of this dough is high moisture content giving a soft texture. Frozen dough is used because the cookie dries after baking, giving a short shelf life. Point of sale baking in small batches ensures the products are completely fresh, with minimal waste. Purchasing ready baked cookies daily can lead to expensive waste. Baker Perkins introduced a new concept offering superior levels of performance, choice and hygiene in the production of frozen dough for soft cookies at the IBIE exhibition in Las Vegas in October. Three additional modules are available for topping, paper cutting and paper slitting and these are combined to create up to six versions for each width. The two industry-standard choices of bulk packing or depositing onto paper are both catered for. On machines below 800mm, a device cuts a paper roll into sheets of the appropriate length; on machines of 800mm and above, the paper is slit and cut. Each choice is available with an optional topping and sprinkling unit. Frozen dough cookies come in a range of sizes and flavors in most types of soft dough. To add value, inclusions are easily added. 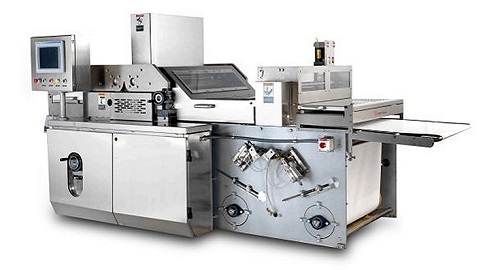 The choice of equipment from Baker Perkins ranges from 400mm wide machines for the craft sector to 1.2 metre wide units for highly automated industrial production. Outputs extend from 225 to 4,500kg/hr.